According to the U.S. Centers for Disease Control and Prevention (CDC), approximately 8.4% of children (6.2 million) in the United States have asthma, a debilitating condition that can be caused or complicated by indoor environmental conditions often directly connected to cleaning and cleanliness. The challenges faced are not solely the domain of children. [...] children can be affected by poor environmental conditions that could worsen asthma and cause discomfort during the school day. Poor environmental health in the school can also affect adults with asthma and can trigger their symptoms as well. Schools can contain numerous sources of potential irritants and asthma triggers that can impact students and staff. Knowing how to properly manage asthma and how to maintain an environment that limits irritants and triggers are effective ways to improve learning and working conditions. The number of adults aged 18 and over who currently have asthma is approximately 19.9 million, or 8.1% of the population. Combined with the number of children with asthma, this leads to an annual death toll of 3,518 people or 1.1% of the population. Conventional commercial cleaning products contain toxic chemicals that can irritate respiratory issues, or lead to asthma-like symptoms, as well as sick building syndrome in otherwise healthy children and adults. The chemicals found in some cleaning products can cause health problems, including headaches and eye, nose and throat irritation. If products contain volatile organic compounds (VOCs), adverse health effects can include asthma, upper respiratory irritation, fatigue, nasal congestion, nausea and dizziness. Cleaning for health, more commonly referred to as green cleaning, can reduce or eliminate many of the chemical triggers and VOCs that can lead to asthma and other health issues when combined with regular, thorough custodial services. Schools are crowded and often suffer from issues far exceeding most businesses when it comes to cleaning requirements. Schools are four times as densely occupied as commercial office spaces and children are not known for neatness. Constant foot traffic stirs up dust and tracks in mud, dust, and debris. Some over-crowded schools have adopted split sessions, some provide breakfasts, after school programs, sports activities, and summer school sessions. The combination of dense occupancy, more than full-time use, lack of storage space for instructional materials or student projects, back-logged school building repairs, materials or furnishings that collect dirt or require special cleaning, and maintenance staff cut-backs can easily overwhelm facility directors and custodial staff. A clean school can reduce student absenteeism, a plague on the U.S. education system that deprives children of much-needed face time in classrooms with educators that results in low grades, poor test performance, and reduced expectations regarding future quality of life. Assist custodial staff by maintaining clear walkways, keeping them free of debris and clutter commonly associated with classroom use. Discontinue the use of any aerosols and scented air fresheners and ask the facilities team to please open windows or increase the airflow into the classroom. Assess current cleaning products for toxicity by reading labels and analyzing Material Safety Data Sheets (MSDS). Schedule and participate in routine custodial and staff training sessions to ensure all areas of the school are adequately attended to in a manner that benefits students and teachers. 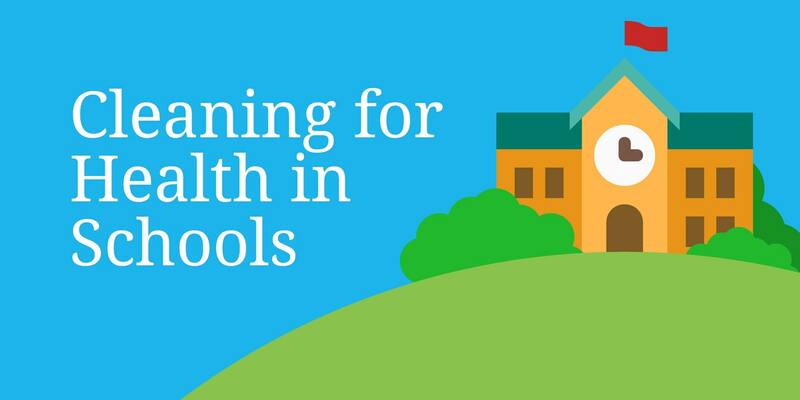 Green cleaning/cleaning for health initiatives are a vital component of a healthy and productive school system that is dedicated to the safety and wellbeing of its occupants, especially vulnerable young children. Navigating the world of commercial green cleaning, including all the various technologies, can be complicated, time-consuming, and appear cost-prohibitive. Outsourcing to an experienced provider with a proven track record of success is a proven method for quickly onboarding these beneficial programs.